We almost went to the wrong one. After reading about O Pazo in a food forum, I googled it and made reservations from the US at the first site I found. Well, apparently, O Pazo is a very common Spanish term (much like casa) and there are at least two of them in Madrid. 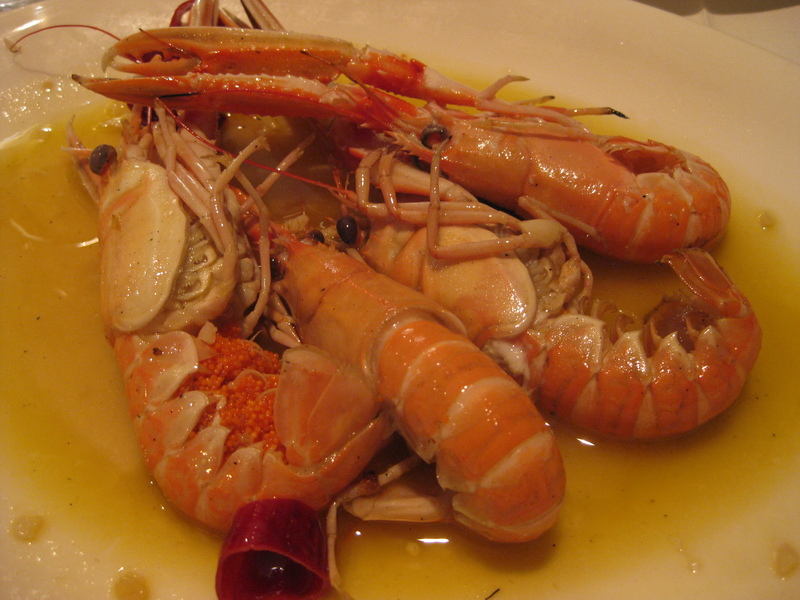 The one renowned for excellent seafood is in Calle Reina Mercedes. Thank goodness for our concierge. The menu is quite simple and short. One side lists the seafood; the other has line drawings of them and short write-ups describing their provenance so the diner gets a better appreciation for them. For more inspiration, I go over to the raw seafood display and chat with the wait staff. Somehow, even with his halting English and my minimal Spanish, we manage to connect and I come away with some excellent recommendations for dinner. They look like mini elephant legs attached to flat claws, so why do these homely things cost EUR22 per 100 grams? It’s certainly not for the complex cooking technique since they’re just plain boiled. They’re expensive because harvesting them can be a daunting task. It takes two people: the adventurous perceibeiro climbs down the side of a cliff overlooking the Atlantic Ocean, a rope tied around his waist as he picks the barnacles off the rocks. Meanwhile, his partner stays at the top of the cliff and yanks him up every once in a while to ensure he’s not whisked out to sea. 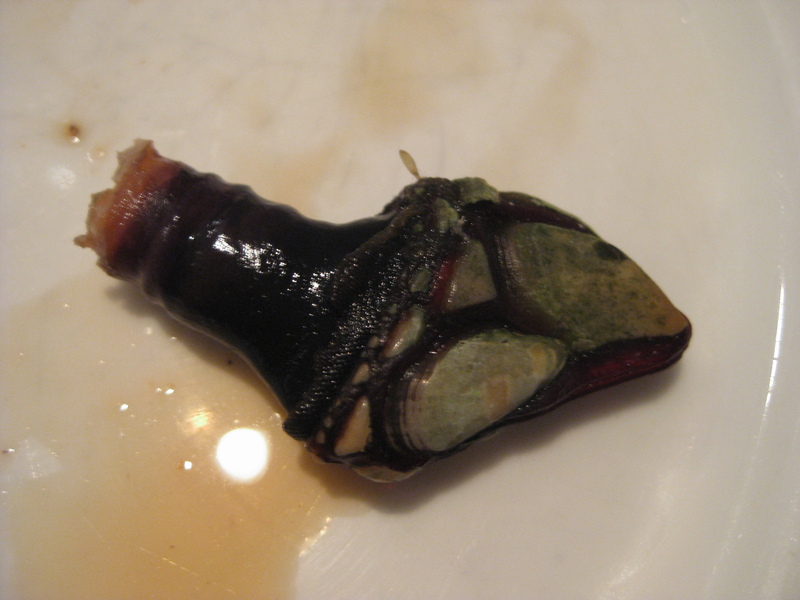 I have been so curious about percebes ever since I read about them in a New York Times article. We soon find out that eating them is quite a challenge. After watching us struggle, our waiter comes by, picks one up from the plate, holds the claw firmly with one hand and twists the body with the other. Instantly, the tough skin pulls away revealing a short column of fleshy meat that one simply bites off. It’s briny and sweet with a somewhat springy texture that reminds me of escargot. 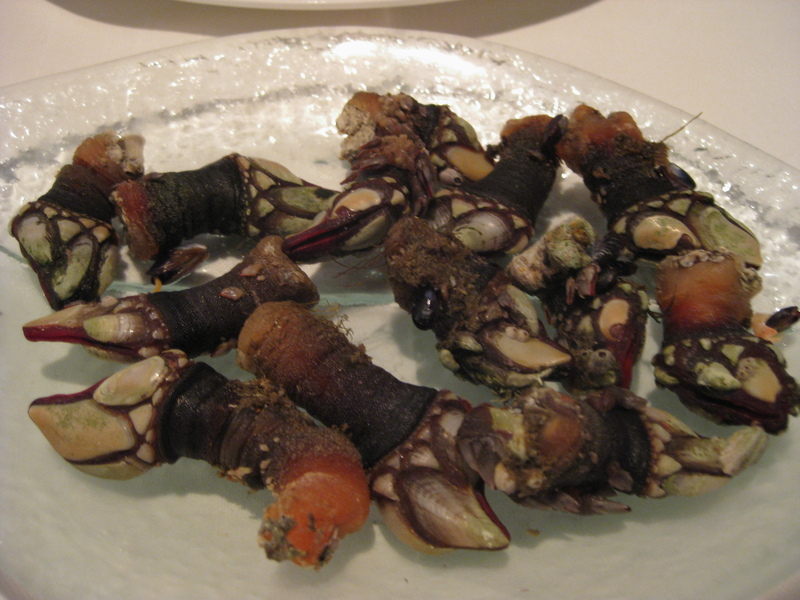 These cigalitas, with their thin brittle shells, are from the province of Huelva in southwest Spain. They are pan sauteed and finished with cava and slices of guindilla peppers. May I just say that they’re the most delicious things ever. They almost make me forget that I’m dining in an upscale restaurant as I attack them with my fingers, leaving no morsel uneaten. From the juicy tomalley in the head to the bits of meat stuck in the claws, they’re all gone by the time I’m done with them. My husband goes even further, sopping up the delicious pan juices with pieces of bread. 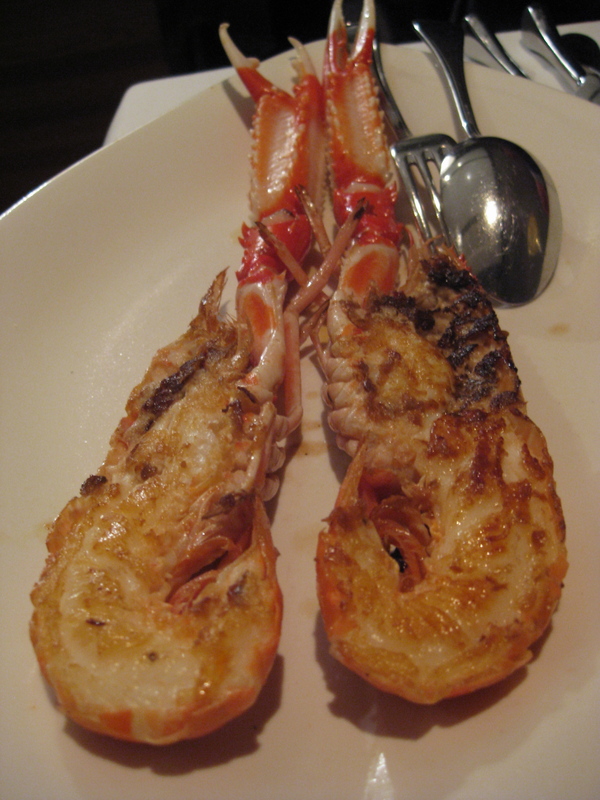 A larger version of the cigalitas, this time just split in half and grilled. The tail meat was sweet enough but I was disappointed that the ones in the claw were tasteless and mushy. This is one of the dishes I love that I don’t often see on US menus. 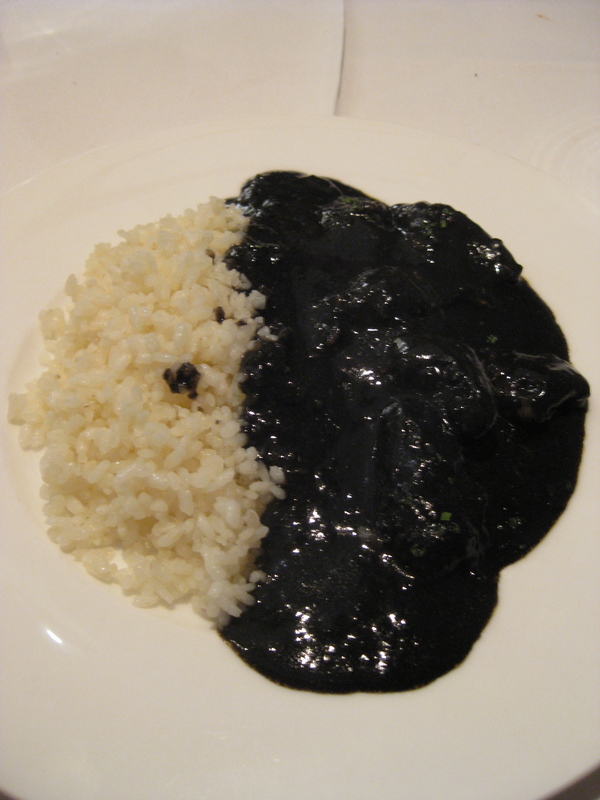 I guess many are put off by the squid ink. The presentation of having the rice and cuttlefish arranged in a yin yang fashion is interesting, but the dish tastes rather average compared to the others. This is a specialty of the house and my second favorite dish. 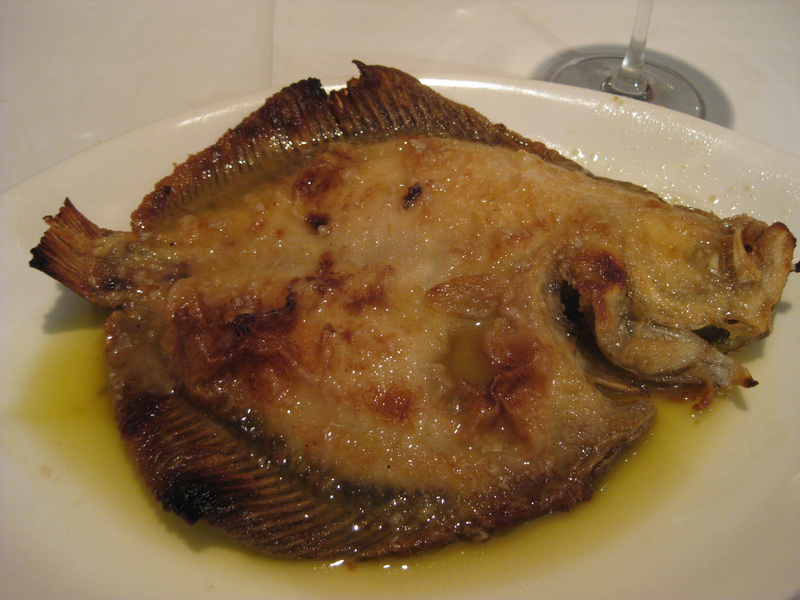 The turbot is baked in olive oil although I could detect a subtle hint of vinegar. The plump gelatinous meat retains its silkiness all through out. It’s flat out delicious. It’s interesting to note that none of our food is served with any side dishes. They’re not even options that one can order separately on the menu. I assume that it’s so the seafood can be king of the plate and the palate. This is not unique to O Pazo as I’d been to other seafood restaurants in Madrid before and encountered the same thing. This meal may be simple, but it’s certainly the BEST seafood we’ve had this trip. Note: A few doors down is another seafood restaurant called Combarro which we also tried one evening. Let’s just say that O Pazo beats it hands down — from value for money to seafood quality and preparation. ~ by Jaded Fork on December 9, 2010. I’ve been to Madrid a number of times but haven’t been to O Pazo. Looks wonderful and I’m wishing I had a trip scheduled so that I could try everything you did! Joan, O Pazo is in the business district area (I think). Not walking distance from Old Madrid but about a 10 min cab ride. I have more posts coming…I love Madrid!